Spaldings The Beast<sup></sup> portable basketball system features a 60 x 36 steel framed, thick, tempered glass backboard with aluminum trim, making The Beast<sup></sup> the first and only 60 glass portable on the market. In addition, the backboard has a 2 offset from the pole, ensuring there is ample room to play under the rim. The Beast<sup></sup> includes a Spalding Pro-Image breakaway rim with wraparound support to withstand serious play. 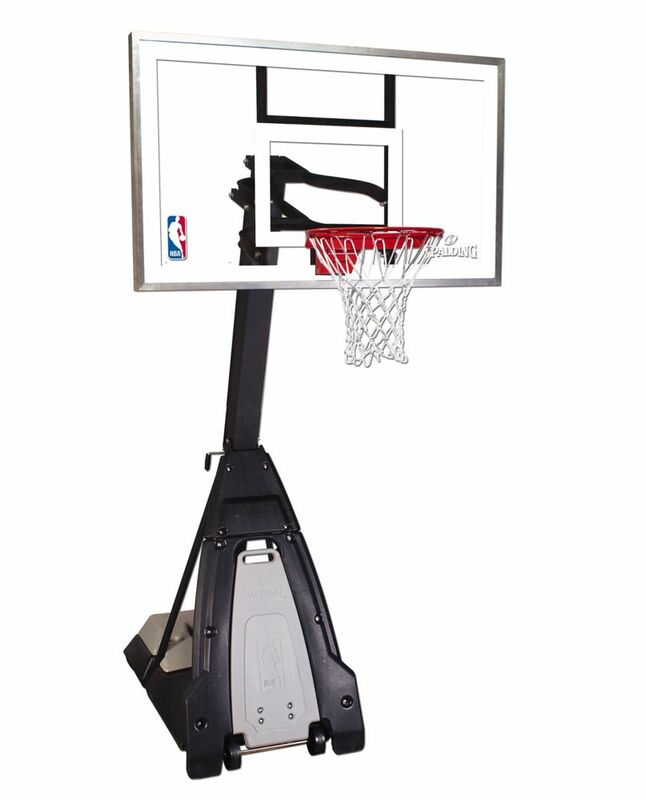 The Screw Jack lift allows infinite height adjustment from 7.5' to 10' by simply turning a crank at the rear of the system, making this a great hoop for players of all ages and skill levels. The 5 square pole mounts directly to the steel base frame for added stability. Spaldings Power Move base and front cover has a built in handle that engages four wheels to make moving and storing the system easy. The front cover also acts as a rebounder during game play. Take your Pilates workout up a notch with the Stamina AeroPilates Pro XP556. Perfect for working the core while boosting cardio, this machine can perform over 100 exercises to improve your strength, flexibility, and range of motion. An AeroPilates Free-Form Cardio Rebounder is included for a gentle yet effective cardio workout. The Beast 60 Inch Glass Basketball System Spaldings The Beast<sup></sup> portable basketball system features a 60 x 36 steel framed, thick, tempered glass backboard with aluminum trim, making The Beast<sup></sup> the first and only 60 glass portable on the market. In addition, the backboard has a 2 offset from the pole, ensuring there is ample room to play under the rim. The Beast<sup></sup> includes a Spalding Pro-Image breakaway rim with wraparound support to withstand serious play. The Screw Jack lift allows infinite height adjustment from 7.5' to 10' by simply turning a crank at the rear of the system, making this a great hoop for players of all ages and skill levels. The 5 square pole mounts directly to the steel base frame for added stability. Spaldings Power Move base and front cover has a built in handle that engages four wheels to make moving and storing the system easy. The front cover also acts as a rebounder during game play. The Beast 60 Inch Glass Basketball System is rated 1.0 out of 5 by 1. Rated 1 out of 5 by Sean from Beast has worst instructions ever Bought this a month ago. Worst instructions on the face of the earth. The main 2 pieces that support the glass and rim didn't fit. Had to pound together for 2 days. Still didn't fit. Called Spaulding and the told me to take stuck piece apart by throwing this 70 pound piece on my lawn 30 times to get it apart. Once apart I was supposed to sand the paint off then pound it back together again. What a joke. I highly do not recommend this product. Do not purchase. Buy a bow flex instead for a laundry hanger or boat anchor.